'Moisturizing' is the keyword in my beauty routine. Moisturizing face is essential to keep the face looking supple and less prone to fine lines. This applies to the other parts of the body too, especially the hands and legs. We have always neglected these parts of the body. Really so thankful for Nivea to come up with this moisturizer to be used during shower. I was so excited and started trying when launched. I never looked back since. I am hooked onto it. It has a creamy texture and the smell is so good. You just need to apply all over the body after your usual shower gel. Then wash it all off. You will feel your skin feeling softer in just the first try. So far I had tried both. As I would usually sleep in the air-conditioned room, the one with Almond Oil will suit me best. Though highly moisturised, it would not leave a greasy after-feel. 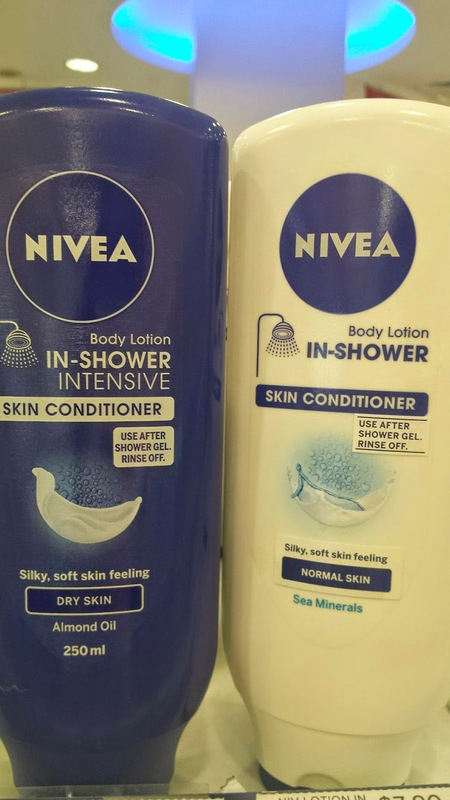 Kudos to the R&D team at Nivea who came up with the water-activated formula. At SGD$7.90 (RRP) per bottle, it is an economical method for the lazybone in you. Available at all personal care stores and supermarkets, including Watsons, Guardian, Cold Storage, Fairprice, Giant outlets and major retailers.